"This easy jambalaya is made all in one pot - your Instant Pot(R)! Heat lovers can double the hot pepper sauce to give it an extra kick. Serve over white rice." Turn on a multi-functional pressure cooker (such as Instant Pot(R)) and select the Saute function. Heat 1 tablespoon of olive oil and cook sausage slices until browned on both sides, 3 to 4 minutes. Remove sausage from pot and set aside. Add remaining olive oil to the pot. Add onion and garlic; cook and stir for 1 minute. Add chicken, bell pepper, and celery. Cook until chicken starts to brown on the edges, 2 to 3 minutes. Add browned sausage, diced tomatoes with liquid, shrimp, thyme, salt, seasoned salt, pepper, and hot pepper sauce, and stir until well combined. Turn off Saute function. Close and lock the lid. Select high pressure according to manufacturer's instructions; set timer 7 minutes. Allow 10 to 15 minutes for pressure to build. Release pressure carefully using the quick-release method according to manufacturer's instructions, about 5 minutes. Unlock and carefully remove the lid after the pressure has released completely. 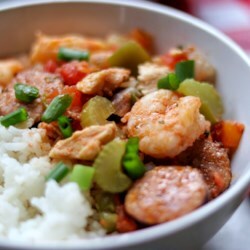 Serve jambalaya garnished with chopped green onions.